Try these 5 snacks if you are looking for healthier alternatives to common snack foods. When you’re living with chronic pain, it can be hard to have the energy to exercise or cook healthy meals. However, making good choices and maintaining a healthy weight may reduce your chronic pain symptoms. If you are looking for ideas for healthy snacks for weight loss, congratulations on taking a step forward! 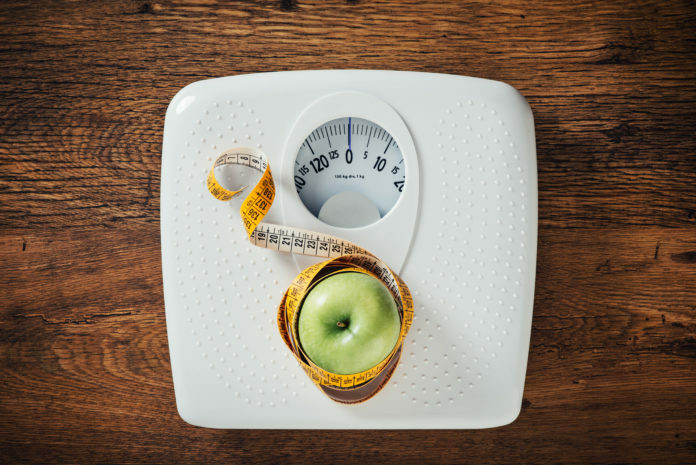 Achieving and maintaining a healthy weight is important in general but is especially crucial if you are living with chronic pain. Being overweight or obese may have a direct impact on the root cause of chronic pain. The good news is that healthy, gradual, weight loss can significantly improve chronic pain, and may even be an option for some people to avoid surgery. Apples are a great source of nutrients and antioxidants. They are also high in fiber. They can aid in digestion, improve gut health and reduce the risk of heart disease. Nut butters such as almond butter are filled with healthy fats, protein and fiber. You may opt for peanut butter instead, but remember that almond butter is more nutrient dense than peanut butter and provides more grams of fiber. Apple slices and almond butter not only tastes great but it is also easy to prepare and good for you. The fiber and protein give your body lasting fuel without the empty calories of chips or cookies. To make the most out of this healthy snack, try to avoid nut butters with added sugar. 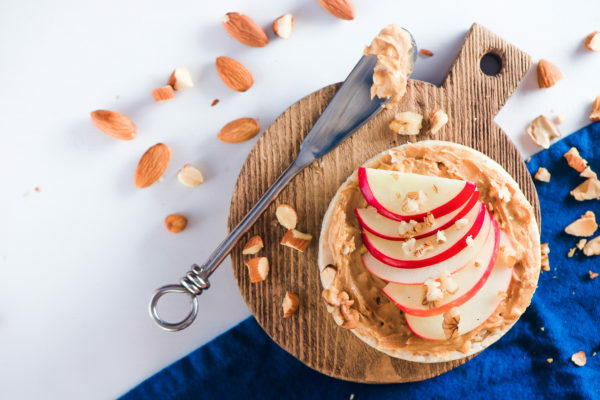 For a quick mid-morning snack, try slicing up one medium apple and adding one tablespoon of your favorite nut butter. You’ll get 2.4 grams of protein and over a dozen vitamins and minerals at under 200 calories. Did you know that a diet deficient in fruits and vegetables is one of the root causes of chronic pain and other degenerative diseases? Keeping fresh plant foods out of your diet can result in what is known as a pro-inflammatory state. In other words, if you don’t eat enough greens, reds, oranges and blue foods, your body tends to experience inflammation that can cause chronic pain. An easy way to incorporate more veggies into your diet is to include them in your daily snack routine. Instead of dipping your vegetables in dressings, try hummus. Hummus typically is made of chickpeas, olive oil, garlic, tahini and lemon. It is high in protein (plant-based protein at that – about 6 grams for only ½ a cup!) and is delicious on vegetables. Buy it pre-made in your local grocery store or whip some up yourself at home in under 10 minutes. 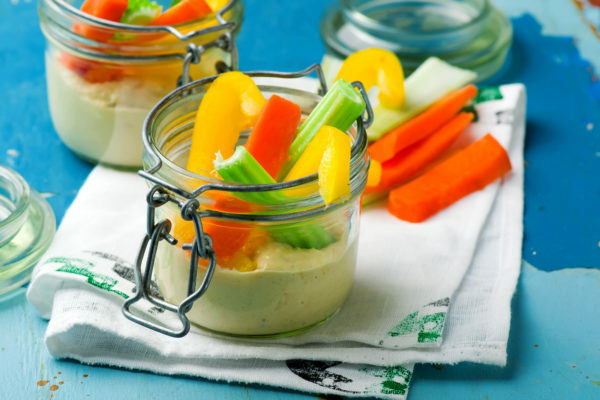 Carrots, sweet potato slices, cucumber slices, bell pepper slices and celery sticks are all excellent choices of vegetables to dip in the hummus. They all have high water and/or high fiber content that help keep you feeling full while helping to keep you hydrated. One-half cup of hummus alone delivers about 20% of your %DV of fiber. Together with a serving of vegetables, you can meet up to half of your daily fiber recommendations just in this snack. Fiber will help keep you feeling fuller for longer. Plus, you’ll enjoy the health-boosting benefits of the nutrients in vegetables.